Jeffrey Allen Torborg was born November 26, 1941 in Plainfield, New Jersey. After attending Westfield high school, he attended Rutgers University. In 1963 he was an All American baseball player, setting a school record & NCAA record batting an incredible .537. Only two other college players have ever hit for a higher batting averages. Torborg also set Rutgers school records for slugging. The Rutgers Knights baseball team posted a .741 winning percentage during his time there. In 1992 he became the first baseball player to have his uniform number retired by the school, as he entered into the Rutgers Olympic Sports Hall of Fame. In 1963 he was signed by the Los Angeles Dodgers as an amateur free agent.He spent just 64 games at AA Albuquerque in 1963 making the Los Angeles Dodgers team the next year. Throughout the rest of the sixties he would be the Dodgers backup catcher, first to Johnny Roseboro then to Tom Haller. Torborg was never the same hitter in the majors like he was in college, but he was a fine defensive catcher. Torborg has the honor of catching three career no hitters, to some of the best pitchers of his era. 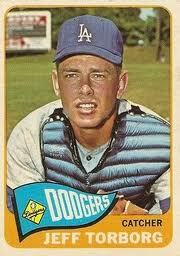 On September 9th 1965 he caught Sandy Koufax’s perfect game against the Chicago Cubs, at Dodger Stadium. In that game Koufax struck out fourteen Cubs batters. Torborg was 0-3 that night. Five years later. on July 20th 1970 he was behind the plate catching Dodger pitcher Bill Singer’s no hitter against the Philadelphia Phillies. Singer struck out ten batters that night, in a 5-0 Dodger win at Dodger Stadium. In Torborg's seven seasons while in Los Angeles, he threw out over 40% of would be base stealers four straight years (1966-1969). In 1967 his 51% was third best in the National League. His best year at the plate was back in 1965 when he batted .240 with three HRs & 13 RBIs in 150 at bats. 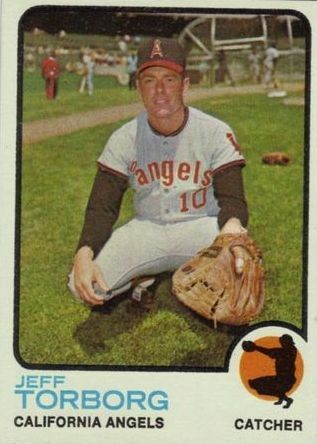 In March of 1971, the cross town California Angels purchased his contract, where Torborg would spend his three seasons playing in Orange County. In 1973 he was Angels main catcher batting .220 with one HR & 18 RBIs playing in 102 games. That season he caught his third no hitter number behind the plate, when on May 15th, Nolan Ryan tossed his first career no hitter. That night Ryan struck out twelve Kansas City Royals in Kansas City. After the 1973 season, Torborg switched to a coaching position, finishing his ten year playing career batting .214 with 297 hits 8 HRs 42 doubles & 101 RBIs in 574 games. Behind the plate in 559 games he threw out 36% of would be base stealers, posting a .990 fielding %. After three years of coaching, Torborg got his first managerial position in 1977. He replaced Frank Robinson as the Cleveland Indians skipper. finishing fifth that year. The Indians then fell to last place in the next two seasons. He was dismissed in late 1979 & returned ten years later as the manager of the Chicago White Sox. In his second year at the helm (1990) he took the White Sox to a second place finish, an improvement of 25 games, which earned him the Manager of the Year Award. In 1991 he finished in second place again winning 87 games with the White Sox. In 1992 he came closer to his home in New Jersey, as he was named the 14th manager in the history of the New York Mets. 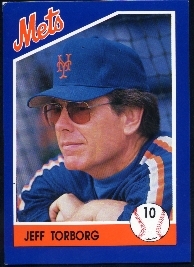 He replaced interim manager Mike Cubbage, who had replaced Bud Harrelson late in the 1991 season. 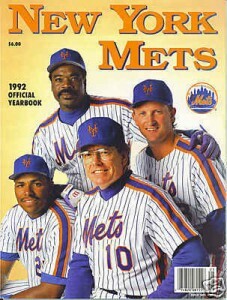 The ’92 Mets were a high paid team of over rated & over the hill free agent players that could not gel together. They finished the season in fifth place & became known as "The Worst Team Money could buy". Torbog’s Mets posted a 70-92 record that year (.444 %) disappointing many fans. The media bashed the team & the fans booed loudly at Shea Stadium. 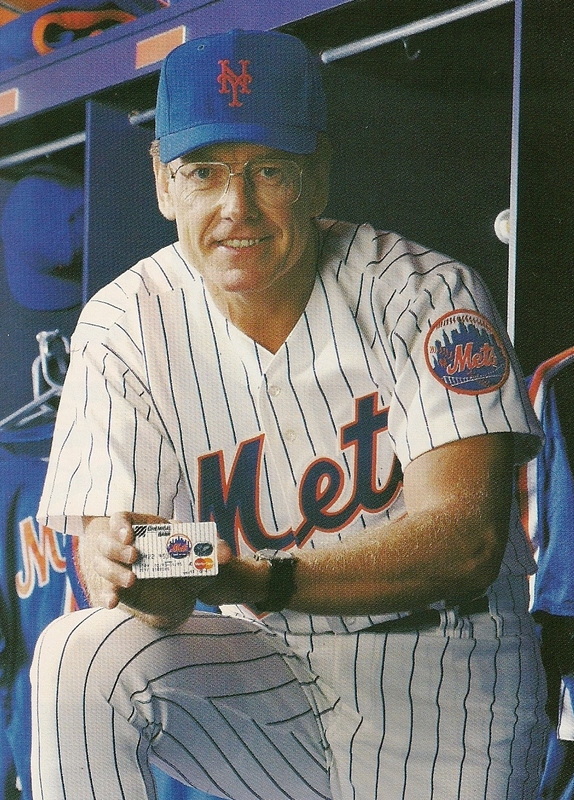 Torborg’s Mets started out the 1993 season at 13-25 before he was fired & replaced by Dallas Green. Torborg would get two more managerial jobs; first with the Montreal Expos in 2001 finishing fifth posting a 47-62 record. He was replaced by Frank Robinson whom he had replaced in Cleveland 24 years ago as manager. Next, he was named the Florida Marlins manager in 2002 finishing in fourth place (79-83). In 2003 he was fired & replaced by Jack McKeon who went on to win the World Series with the team. Torborg has also been a successful broadcaster for the FOX network, CBS radio & the Atlanta Braves on Turner South. 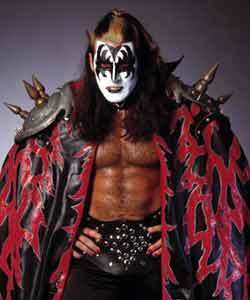 Family: His son is a former pro wrestler Dale Torborg, known as the Demon who donned make up in the style of Gene Simmons of Kiss. Jeff’s daughter in law is Christie Wolf, also known as Asya, also was a pro wrestler & female body builder. She & Dale were married in 2000 & have one child.